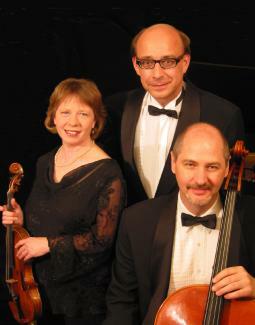 The Ambrosia Trio, now in its third decade, focuses primarily on standard Classical and Romantic piano trio repertoire. The group is based in New York City and performs regularly across the U.S. Offers masterclasses, educational programs and workshops, and has collaborated with dance companies and composers. The trio has recorded two CDs. Also known as Ambrosia and Friends, the ensemble can also include piano quartets, duos, and other combinations. Founding members: Beulah Cox, violin; Martin Fett, cello; Frank Daykin, piano.